They continue by noting: “Suspending your search isn’t the best strategic move. You can accomplish a lot during these 45 days. In addition to applying for jobs and staying in touch with potential employers, you can increase your networking and professional development efforts.” It can also be a good time to make sure your resume and cover letters are up to date, and your business contact card looks crisp and professional. The holidays are also a great time to build and expand your networking base. 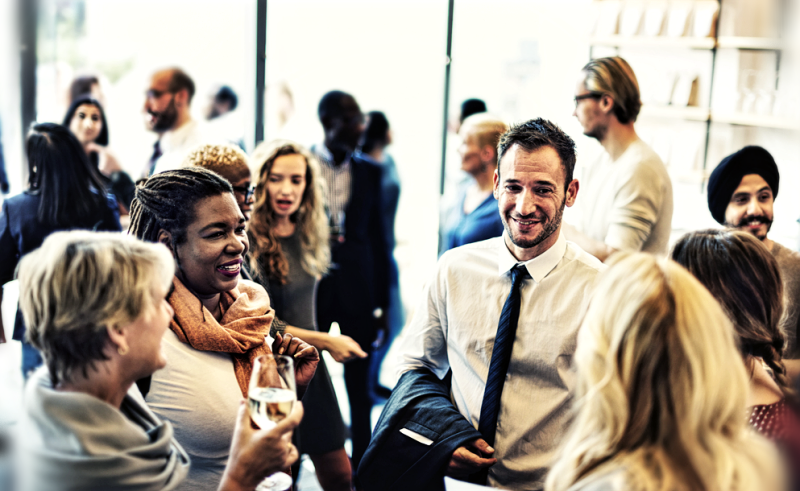 Networking is critical in any job hunt; and holiday parties, end-of-the-year conferences, and gatherings are terrific ice breakers to make introductions with people who would be beneficial for your career goals. Get names, emails, and make yourself known; but remember how important it is to make a good, clear first impression if you are meeting somebody for the first time. With that being said, because people tend to be more open to socialization during this time of year, job seekers can also organize holiday drinks with people they want to connect or reconnect with. Although this should go without saying, we need to remind party-going-job hunters how important it is that you keep a professional approach to your career advancement at all times, even when networking at social events. Often, “eating, drinking, and being merry” can lead to trouble when networking in a social event with professional contacts. Alcohol can add a false, heightened sense of security. Think carefully about what you say, and how you conduct yourself. Never, EVER, beg for a job; even in a joking way. It can make you come off as distasteful, and could possibly make some people uncomfortable. Either way, begging, or saying the wrong thing to the wrong people will hinder your progress in the job hunt. The rum punch might be enticing, but it is hardly worth jeopardizing your business efforts, or reputation by saying or doing something you would regret later. It is essential to keep control of yourself during these networking opportunities, and not drink too much or say something you shouldn’t. Have fun, and be productive, but remember that no joke (or drink) is worth the expense of your reputation in your networking circle. Your efforts will be rewarded in the long run. Above all, don’t lose focus on your ultimate goal of finding that perfect job. Staying motivated during the holidays can give you an excellent competitive edge over the applicants who put their job search on hold for those 45 days come January. “The biggest thing is to keep at it. Around the holidays, it’s easy to get caught up in all the distractions. Set aside that time every day and continue to look for opportunities.” says Milton Devonport, the content manager of Custom Essay Order service. Above all it is important that you don’t lose steam, and get lazy. Allowing yourself to slack off for a month could ultimately lead to lacking in motivation and drive to meet your goal. “The idea is for people not to assume that because it’s the holiday season that they shouldn’t redouble their efforts”, Milton adds. “This is a really good time of year. People are much more willing to go out for drinks and spend a little more time. Use this time to forge relationships, not just look for the job.” In conclusion, it is vital to remember how important it is to keep focused and stay on track during the holiday season. Even if you choose to take a brief time away from your job hunt to concentrate on rejuvenation, try not to fall into a pattern of being lazy. It is a wonderful time of year to take advantage of the creative opportunities made available by businesses’ new budgets and hiring structures for the new year. Take advantage of the great opportunity to work on expanding your own business networking circle, and concentrate on getting ahead of the game to surge forward into the full swing of your career hunt.